In case you haven't noticed, I'm sort of obsessed with my muffin pan at the moment. 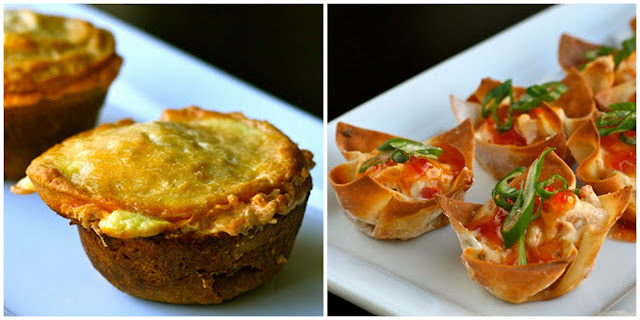 Lasagna Cups, Mini Quiches, Pita Cups, Elmo Cupcakes (though that one is sort of expected), but you get the idea. I can't help it. Everything just turns out so adorable and, well...mini! If you are also a fan of the muffin pan mania, I've got good news for you. The second installment of my Super Bowl mini menu exclusively enlists the help of a muffin pan to make these miniature main dishes. When you think about game day food, pizza and Buffalo wings would both make the Top 5. For pizza, why not make individual pies so that all of your guests can have their own? (UPDATE: check out this even MORE mini pizzas). And you can't have a football party without hot wings. But they can be a pain (and a mess) to make and eat. How about combining all of the flavors you love about hot wings and bake them together in a deliciously spicy individual pot pie? And finally, if you want to go a little more non-traditional, try this Asian-American appetizer, shrimp rangoon (made in a mini-muffin pan). Just as with Part I, these delicious step-by-step tutorials can be found over at Brit, so head over and check them out! P.S. If you are confused why I'm skipping ahead momentarily to "S"...I explained it in my first Super Bowl Post. Preheat oven to 425 degrees and spray cavities of a muffin pan with cooking spray. Remove pizza dough from packaging and allow it to come to room temperature on a floured surface. Using a rolling pin or your hands, roll out into a thin layer. Using either a round cookie cutter, an egg fry ring, or even an empty can, cut rounds out of the dough. Using your fingers, stretch the dough without tearing and press into muffin cups. Next, assemble pizzas. I like to put a small slice of fresh mozzarella in first to prevent crust from getting soggy. Top with 1-2 tablespoons of pizza sauce, another small slice of mozzarella, and some parmesan cheese. Sprinkle with a little Italian seasoning and add your favorite pizza toppings. Bake for 15-20 minutes, or until crust is golden brown and cheese is melty and bubbly. Preheat oven according to instructions on biscuit package. Spray cavities of muffin pan with cooking spray. Mix together chicken, cream cheese, ranch dressing, wing sauce, shredded cheese and vegetables. Set aside. In a small bowl, lightly beat egg and water to form an egg wash (if using). Using a piece of string, cut each biscuit in half so that you have two thin rounds. Flatten rounds and press into muffin pan. Evenly divide chicken filling among the muffin cups and top with the remaining 12 biscuit rounds. Try to press the edges together and seal with the bottom portion of dough if possible. Cut two small slits in the top to allow steam to escape. Brush the tops of each pot pie with egg wash (this will help them turn a nice golden brown). Bake in the oven for about 20 minutes or until dough is cooked through and golden brown. Pre-heat oven to 375 degrees. Spray cavities of a mini muffin pan with cooking spray. Pat shrimp dry, chop into bite sized pieces and season with kosher salt and chile powder. Heat olive oil over medium-high heat and saute green onions, chili pepper and garlic until just soft (about a minute). Add the shrimp and cook until pink. (Don't overcook!) Toss with fresh lime juice and cilantro. Combine cream cheese, Worcestershire sauce and shrimp mixture in a medium bowl. Set aside. Place a wonton wrapper in each mini muffin cavity. (Part of the wrapper will stick out over the edges). Bake for 7-8 minutes, or until edges are just starting to turn a golden brown. Remove from oven and spoon shrimp/cream cheese mixture into the cups. Return to the oven and bake another 7-8 minutes. (If you want the edges to brown up, lightly brush with a little olive oil). While cups are baking, make the sauce. Whisk together pepper jelly, mustard and vinegar. You can either serve as a dipping sauce, or spoon a little into each cup before garnishing. Garnish each cup with sliced green onions. How do I find the recipe/directions for making my own mini deep dish pizzas? The look fantastic and yummy, perfect for super Sunday! Oops, found where the recipe is. Going to make them Friday as a test, should be perfect on Sunday. Thanks a lot, Jaymee!! Been fun following btw. No worries! Let me know how they turn out! I made the mini deep dish pizzas for my family. They are now addicts! My son may never want a sandwich in his lunch again. The mini pepperoni slices are just too cute. Keep the great ideas coming. Thanks! Aren't they the best! Glad you like them! Hi! You need to click on the link above to take you to brit.co. Thanks for stopping by! In the buffalo chx pot pie recipe, you say to use 1/2 franks red hot. Is that 1/2 a cup or 1/2 a bottle? Just trying to clarify. Thanks! Do you use mini muffin pans or the full size (cupcake) muffin pans? Looking forward to tryin these out. Thanks! I used regular cupcake pans for the pizza and pot pies. I used mini muffin pans for the rangoon. Enjoy! Think these would work just as good in mini muffin pans? Going to be cooking for a larger group and want them to go farther. Thanks! I don't see why not.... You probably just don't need to cook as long. I am indeed a fan of muffins and they look already amazing in the pictures. Thank you for these lovely recipes! The deep dish pizzas were amazing. We made 20 of them from 1 roll of pillsbury pizza dough. I used a large canning top to cut them out with. We used the small Hormel pepperoni's. These are wonderful and if you love pizza you will love these.